This is how you know that your golf game is really bad. First of all, your ball lies in the sand trap. And second of all, the Sand Hill Cranes won't even pay any attention to you. This photograph was take at Twin Rivers Golf Course in Oviedo, Florida. I wanted them to look up so I could have a good picture but they just kept at their grooming. We've followed this family since the chicks were about four inches tall. Nothing makes me more upset then having one of the chicks disappear. 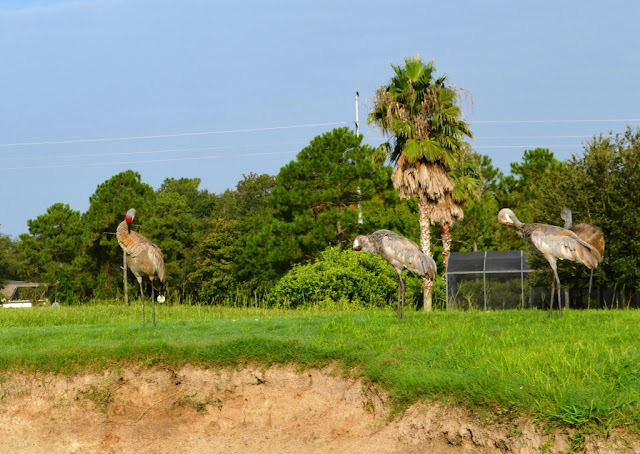 Sand Hill Cranes (Grus canadensis) are year around locals to Florida, parts of the gulf coast, and Cuba, they migrate to Oregon, Idaho, Nevada, Montana, Wyoming, and around the Great Lakes as well as Central Canada, and Alaska where they are summer residents. They feed in dry fields but return to water at night . See wikipedia for a full list of Cranes (clade Gruidae) in the group Gruidiformes. Current issue of http://www.scoop.it/t/birds features the spotted nutcracker, many photographs, what to do with baby birds, bad spill or is that spiel about woodpeckers, odd blue jay behavior and much more.